The Model 5013 incorporates a ring-shear crystal mass assembly within a stainless steel body to provide an extremely reliable sensor that is virtually insensitive to environmental inputs such as base bending and thermal transients. Signal ground is connected to the outer case of the unit. 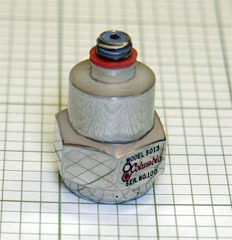 This unit features a 10-32 top connector and is provided with a 10" lownoise coaxial cable. The sensor is also supplied with a 28 removable stud for mounting.